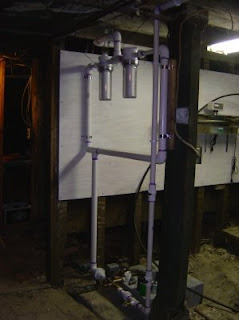 Jeff (our plumber) finished all the piping for our water treatment system today. Due to the inclement weather he had a late start, so we didn't get to move the pressure tank, and cut the water supply over to the new system. Tomorrow. After we finish the water treatment system tomorrow, we'll get started on the grease trap. Boy, this is exciting! Mike (our electrician) promised to come by tomorrow as well, so it'll be a full house. Things are moving forward. That is totally exciting!